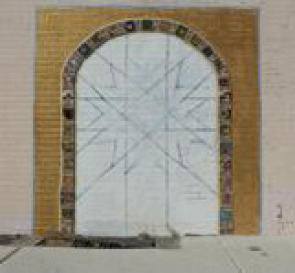 PhilaPlace - Al-Aqsa Islamic Society: Creating the Mural, "Doorways to Peace"
Al-Aqsa Islamic Society: Creating the Mural, "Doorways to Peace"
Corner of building at 1501 Germantown Avenue (Al-Aqsa Islamic Society), being prepped for the Doorways to Peace mural. I am a sculptor and mosaic muralist living in the Old Kensington section of Philadelphia with my wife, poet Caren Lee Brenman. 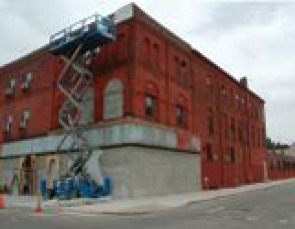 In the fall of 2003, Cathy Cohen from the Arts & Spirituality Center asked if I would be interested in creating a mural for the Al-Aqsa Islamic Society mosque that occupies an old furniture warehouse building on Germantown Avenue. Being Jewish, this presented me with an exiting opportunity to be part of an interfaith art project with Muslims and Christians. It was also a surprise to find out that the mosque and vibrant Palestinian community was only just a few blocks from my home and studio. After 9/11, the members of the mosque were looking for ways to reach out to the neighborhood and wider community. The first person I met from Al-Aqsa was Adab Ibrahim who is a dynamic personality and a great community leader. Her enthusiasm and excitement toward creating this mural and the possibilities of it building bridges and connections was inspiring. 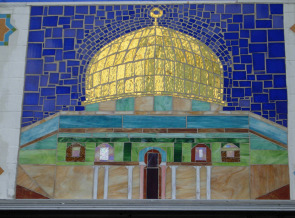 The Al-Aqsa Islamic Society, the Arts & Spirituality Center, and the Mural Arts Program were the main sponsors of this mural. Artist Cathleen Hughes from the Mural Arts Program also joined us in designing the mural and created the beautiful paintings on the building. 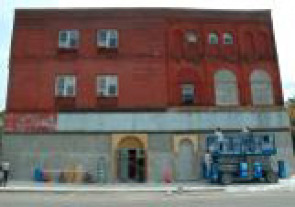 In the spring and summer of 2004 we began installing and painting the mural transforming the building into a celebration of Islamic art and culture. 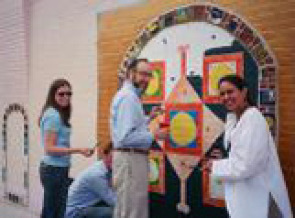 This transformation extended to many in the community as the mural making process created an atmosphere of trust and friendship. The mosque became a place where people from the neighborhood, churches, synagogues, and mosques came to talk and work together. 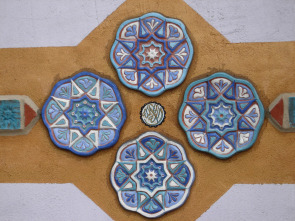 From the workshops we created star shaped tiles for the 99 attributes of Allah. Artist Fadwa Kashkash beautifully wrote the 99 names in Arabic calligraphy with the English translations below. She also created the banner sign that runs the length of the building. Being part of this mural project was very meaningful for me. I learned about Islamic art and culture and it was a gift to meet and become friends with so many wonderful people from the mosque. For the wider community, the mural is a living example of how art can bring people together from different faiths and communities to work in peace.